... somewhere underneath, there's a garden ! thanks Terra, when did you get the snow, its been just flurries here....thankfully! Hi Pam ... thanks .. snow fell Monday evening ! Hi Tt. to me it looks as though he's thinking to himself, I think I'm going to need a bigger spade, lol, Derek. Lol. thank you Derek ... at least he wasn't using the pink coloured spade .. I gave that one to Truffle ! Oh dear :o( I hope it thaws away soon ! Conker is so cute and a very scenic picture. Conker likes the snow ! You would think it would give him very cold feet. Well done Conker. Hi Linda ... Truffle doesn't like getting his feet cold in the snow... Conker doesn't seem to mind ! Terra, by the look of it you have had a lot of snow falling on you! WOW! That's a lot of snow! I can't imagine snow...it was another 80ºF (27ºC) day here...and it'll be this warm here for a least a week. ohh, so cold, what a job Conker !lol! Thats a good idea...doggy wellies then Truffle could play out too.....maybe knitted bootees for when they come inside ? Drizzle here but very cold. Some snow still lying around. Is Conker trying to earn some extra treats? Conker looks well chilled ! Thanks Gnarly gnome ... Conker was really happy, working out there in the chilly snow ! He's such a help though , Tt . Love him ! 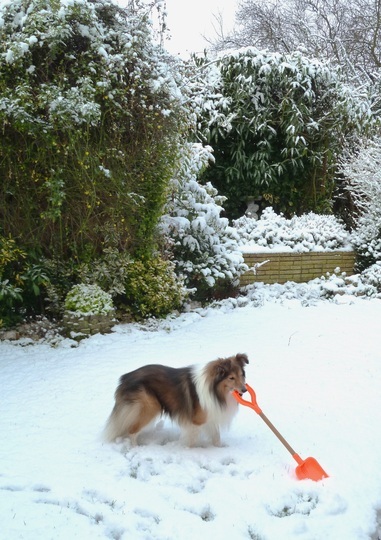 Conker very busy with snow shovelling. A slight sprinkle about Tuesday is all that has fallen here. Please send Conker and his little spade over here, would you, Terra? We have 3' of snow and getting out of the house and up the garden path has been a tad difficult. Shovelling keeps you warm, though. Buildings and power lines have been damaged by falling trees with the weight of snow on them, and the council snowplough has done its usual trick of piling up a 4' wall of compacted snow across our driveway. Virtually the whole Bologna area has been blacked out for between 10 and 60 hours. We have been fortunate in that ours only lasted for 17 hours. Let's hope all the violets, hellebores and primroses that were out last week are safe under this tremendous weight of snow. Roll on Spring! Conker certainly looks happy enough digging his way through all that snow! Can't blame Truffles for staying inside though - I would as well! Thanks everyone .. Keep safe in this cold weather. I would agree with you, Balcony ... stay indoors till the weather warms up ! In the same position since autumn, lol. That is a lot of snow TT. We have not had anything like that this year. Conkers furry coat is good protection from the cold. Lovely photo I think he s looking for the snowman to play with. He's a busy boy. Always another job for him to do. Why is it that long haired dogs love the snow and can't resist a big puddle? Missed these, you did get some snow TT......and quite a bit by the look of it. Thanks 3d, Homebird and Dotty ..
Conker is happy in the snow, but Truffle soon feels cold. The snow was quite deep, but didn't last too long.